Mission Status: No incidents to report today, except that our crew biologist was kind of trippy today in the EVA session. She had to many pancakes. Sol Activity Summary: Or is this just fantasy? Today we met with Survivorman, also known as Les Stroud. A pretty calm guy with really interesting experiences around the world. Both he and the cameramen were great and we had a great time. But first, let’s explain how our day started: It was just a normal day… expecting the arrival of Survivorman, but a normal day none-the less. We asked again about the pancakes and all those things that became inside jokes around the crew. And then we realized: Man, this will be our last night in MDRS, right? The thought is kind of frightening… specially for me, because I need to do an exposition in my University about some paper I haven’t even read. 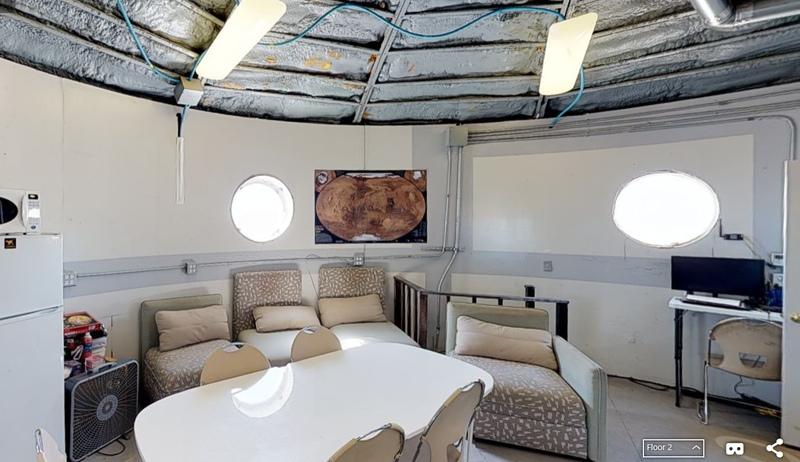 I would like to stay in MDRS at least a little bit longer. The bacterias I cultivated here have so many different shapes and colors, it is quite exciting for me as a wanna-be microbiologist. After the philosophical moment, Survivorman arrived! Fortunately, we planned an EVA today, one where yours truly participated. We went to the Lith canyon. The new ATVs were great, but the trekking there got tiring after a while. We were so tired that some crewmembers here made some associations with Igor the donkey of Winnie the Pooh (Get it? There’s a place called after Pooh, so we think about Winnie the Pooh characters… ok, maybe that’s another inside joke). The cameramen started filming us, and I must say they got nice shots. That Lith Canyon place is absolutely beautiful and so interesting. It had so much geological material and the plants there were thrilling! I will always be amazed by how life still goes on even in such places as deserts. We arrived to the hab with the filmcrew and decided to take some lunch. But, before that, we decided to do what we were expecting since day one: Eating the russian space food that they sent so gently to us. We were waiting for Survivorman to make this even more epic. And there we were, holding our toothpaste-like tubes to our mouths, tasting the meat and the apple pure. I must say that I liked both, but some of the guys just couldn’t get around with the new flavour. Anyways, it was quite a shocking experience. After a nice lunch at the hab, we finally got some rest. I had to do some work at the lab, but the guys stayed here to help bring in the new food for the next crew. 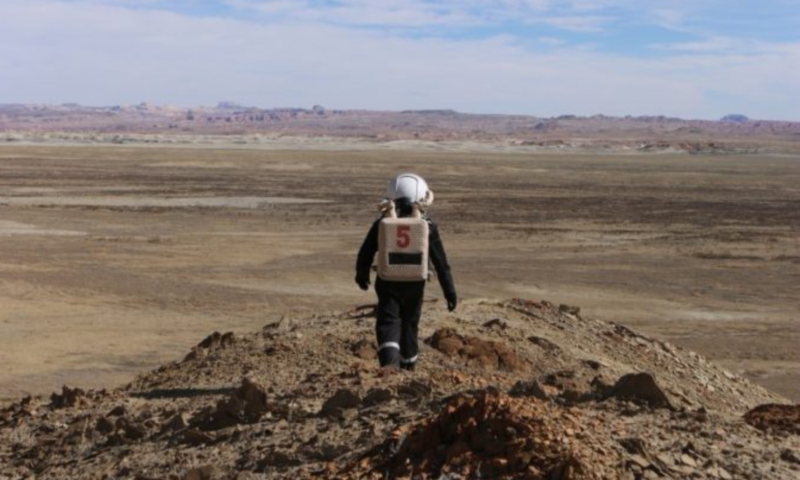 I still can’t believe this will be our last day at MDRS. 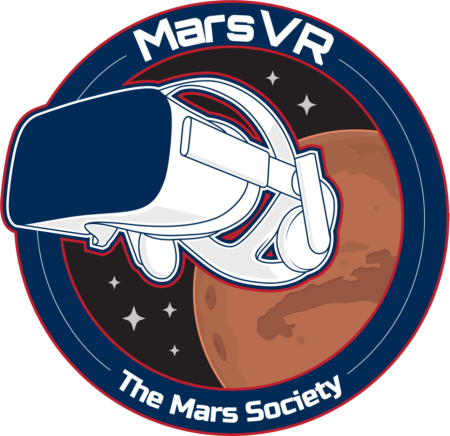 But I’m glad I had the chance to get to know the crewmembers, as well as Survivorman, the people of Mars Society we got to know (yes, even the Capcoms) and, of course, the desert. Maybe a proper thank you wouldn’t be enough, y’know? But at least I have a story to tell my grandchildren in the future, with some good pancakes. Look Ahead Plan: Our homes are waiting in our respective countries, so as long as we arrive on time and safely, that’s the only plan we have. Weather: Windy and with some rain. EVA: Most of our EVA is explained in the summary. We collected some samples of geological interest. The cameramen did some shots of our activities during this EVA.